Today is our second birthday and we originally had planned on filming the MGS4 marathon today; however, we have had to delay it to June 21st. More details will be coming later this week. Oh and no cut scenes will not be skipped. Are u guys gonna borrow a PS3 from someone? Are they really going to do it even with the very long cut scene? Well good luck guys. triple w000t! i thought it was going to be another episode but what the hay its a marathon! The 14th is on a Saturday? Nice. I’m looking forward to it. Wait…is the game out now? hope this marathon take 12 hours, it will be nice. 12th is when the game comes out. This is going to be great. I think world sould play this one since he is good at sneaking. and overlord i guarantee that world would play for most of the marathon and also, learn spelling. Sweet, kinda knew this marathon was inevitable, it would be dumb NOT to do this marathon. By the way, I think that 90 min cut scene was just an over-exaggeration. I post a review of MGS4 and tell you guys how long the cut scenes are. 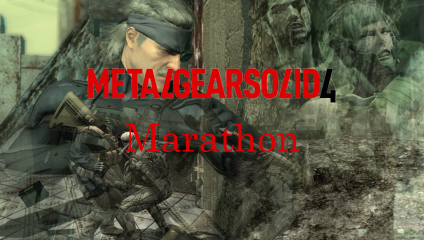 MGS4 arrives on thursday and marathon arrives shortly after. Awesome weekend confirmed! Ha Ha! Worlds time to shine! Never been much of a MGS fan but I’m really looking forward to this one. Thanks for the marathon mempf. For Some Reason I have never been able to find the MGS3 HPAW video. So, because I have never seen it I have never been a fan of the MetalGearSolids. But I hope this marathon changes my mind like all the other games HPAW has shown.